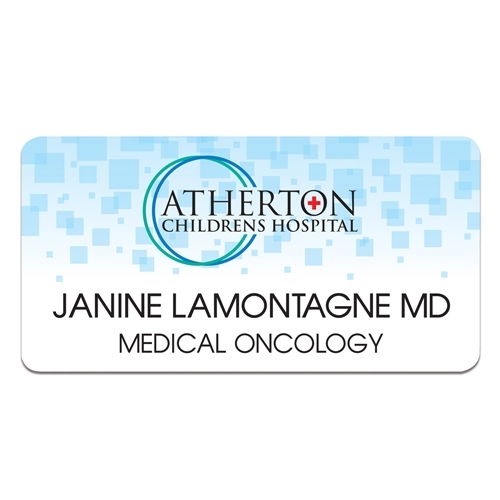 These credit card sized laminated card stock ID cards are printed in vivid full color. Print on second side included in cost. These are great for clubs, organizations, fundraisers, identification and much more. 100% Made in the USA. These credit card sized laminated card stock cards are printed in vivid full color. Add bulldog clip or lanyard for an additional cost. Printing on the second side or adding personalization are also available for an additional cost. These are great for clubs, organizations, fundraisers, identification and much more. 100% Made in the USA. These credit card sized pvc cards are printed in vivid full color. Print on second side or add personalization for an additional cost. 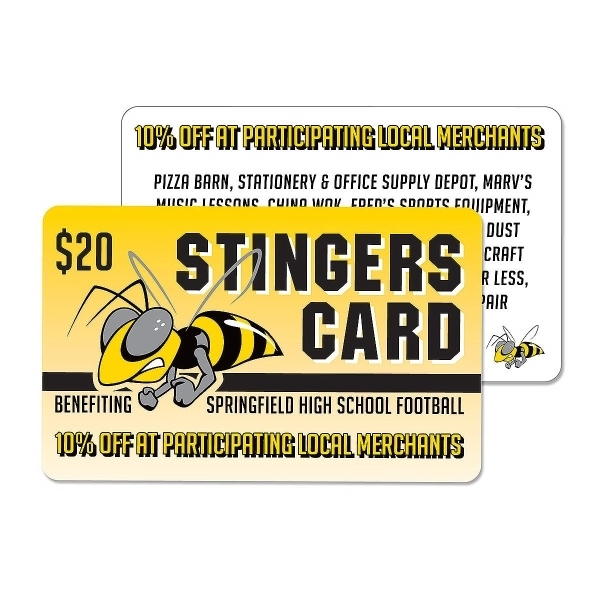 These are great for clubs, organizations, fundraisers, identification and much more. 100% Made in the USA. These credit card sized pvc cards are printed in vivid full color. Add bulldog clip or lanyard for an additional cost. Printing on the second side or adding personalization are also available for an additional cost. These are great for clubs, organizations, fundraisers, identification and much more. 100% Made in the USA. 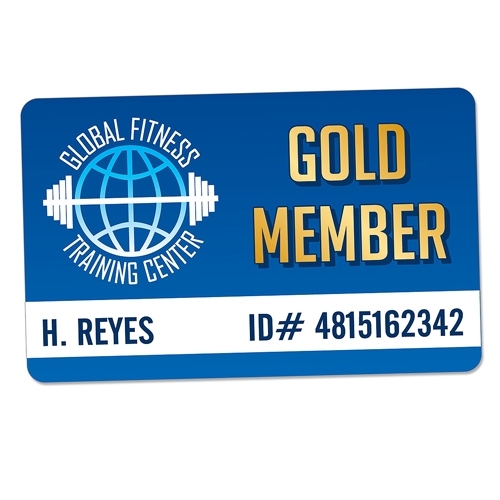 These small credit card sized aluminum membership cards are printed in vivid full color. Choose from satin silver or satin gold. Add personalization for an additional cost. These are great for clubs, organizations, fundraisers, identification, business cards and much more. Please specify color when ordering. 100% Made in the USA. These large pvc cards are printed in vivid full color. Add bulldog clip or lanyard for an additional cost. 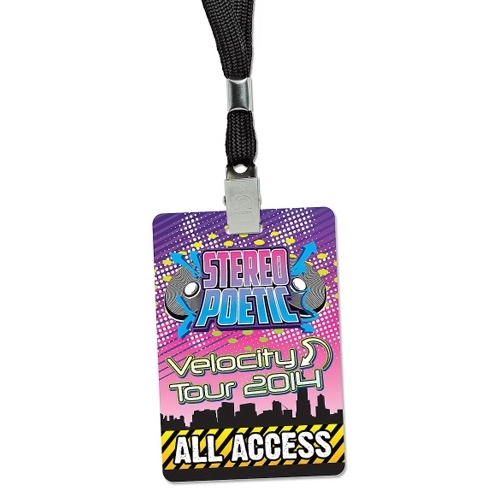 Printing on the second side or adding personalization are also available for an additional cost. 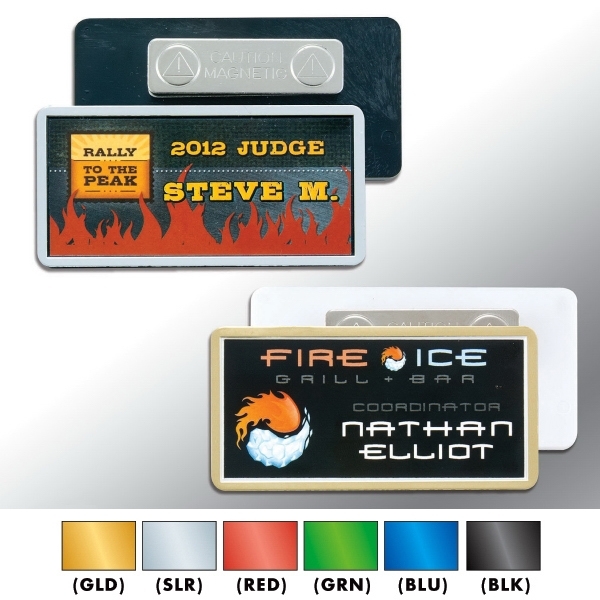 These are great for clubs, organizations, fundraisers, identification and much more. 100% Made in the USA. 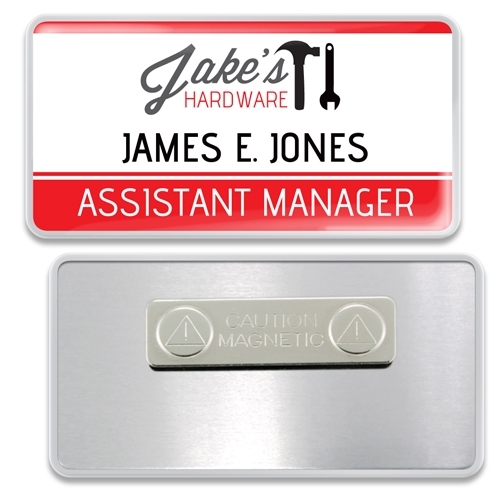 This rectangular plastic name badge has a metallic foil framed edge. The artwork area consists of a full color printed digital label with high gloss lamination. These are great for business events, retail use and much more. Choose from 7 foil colors. Please specify plastic frame and foil edge color when ordering. Personalization and a magnetic attachment may be added for an additional cost. 100% Made in USA. 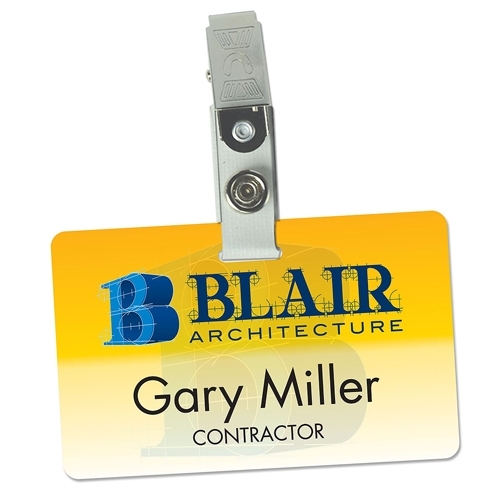 Our "standard" name badges are direct-printed in vivid color on to a lightweight plastic blank. 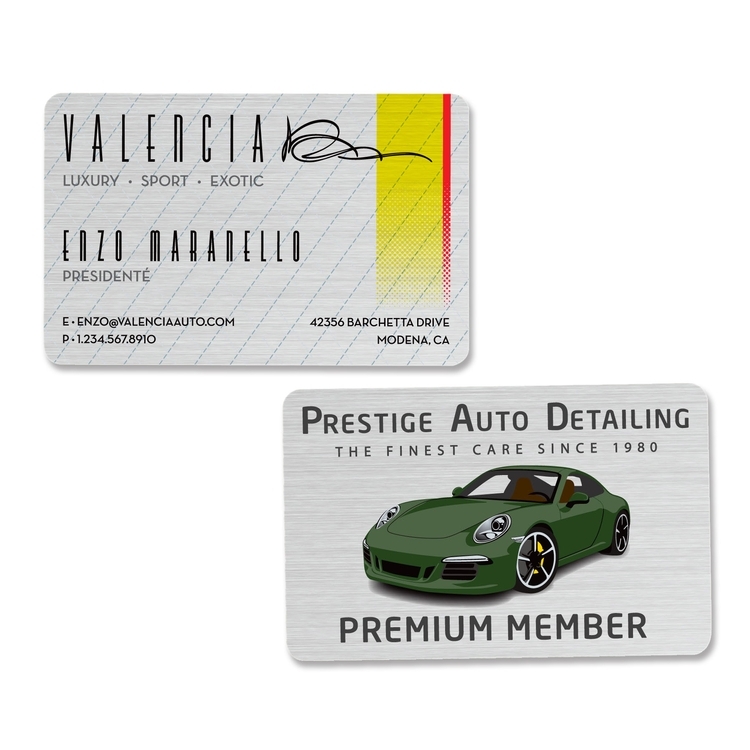 They are vailable in white with a black core and are produced from LaserMAX engraving stock. Pricing includes plastic blank and printing of your full-color logo. Personalization and a magnetic attachment may be added for an additional cost. These are great for business events, retail use and much more. 100% Made in the USA. 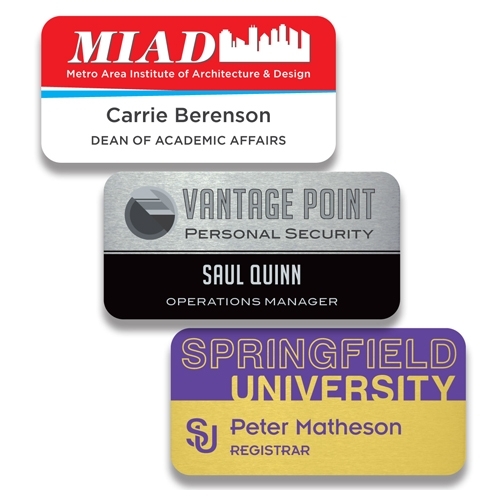 Our name badges are direct-printed in vivid color on to a lightweight aluminum blank in white, silver or gold. Personalization and a magnetic attachment may be added for an additional cost. These are great for business events, retail use and much more. 100% Made in the USA. 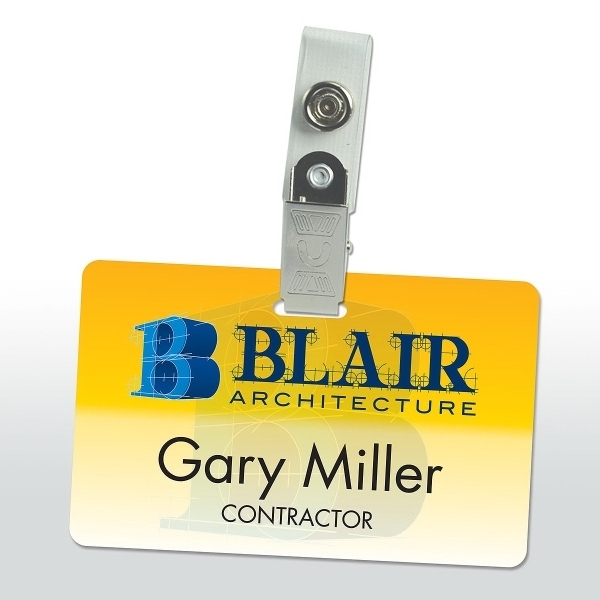 This rectangular aluminum name badge has a full color print, then a plastic snap-on dome is applied. Choose from satin silver or white. 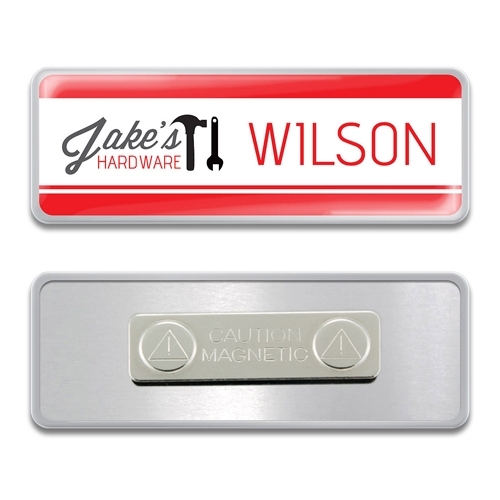 Add personalization and/or a magnetic back for an additional charge. These are great for business events, retail use and much more. 100% Made in the USA. (Magnetic devices must not be worn with pacemakers or similar devices).